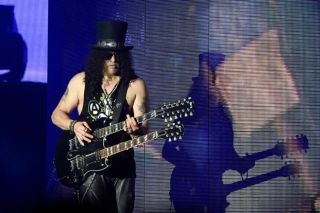 Slash: Did Leather Pants Keep Him Out of The Stone Roses? Slash, who's best known for his work with Guns N' Roses, apparently once offerered to join another set of roses—the U.K.'s Stone Roses. The Stone Roses Premiere New Song, "All for One"
At 3 p.m. EST today, U.K. rockers Stone Roses premiered their new single, "All for One." At 3 p.m. British time, the original lineup of The Stone Roses -- singer Ian Brown, guitarist John Squire, bassist Mani and drummer Reni -- announced that they are a band again.